I don’t need no night stand or fancy shams because you have the mother of all Crucifix’s on the wall…. Heh! Yeah, I noticed that after I had posted the photo and thought, “Oh well, I guess it’s pretty evident that a little old Catholic lady once owned that thing.” It IS a pretty one though. Get over here, sista! I am off to buy porridge! Thanks for the invite to use the guest room. Somehow I don’t think your present John would appreciate this John taking you up on your offer. By the way, it seems to me that a Dicktionary is an unusual place to list the term “levelicity.” It sounds like it should contain much more earthy terms. And, another by the way: Why is this reply appearing in a large, bold typeface??? I didn’t choose it, it just appeared, and I have not taken the effort to try to change it. We’ll see if it is applied when the reply is posted. The other replies don’t appear to be in this typeface. Perhaps it is just for me because you know my fragile ego needs stroking. Stroking – now there is a term for the dicktionary. Yup, the large bold stuff went away when posted. OHMIGOSH! (stoking ego, stroking ego, stroking ego), Of course it’s in bold type! It was set up to only give you bold type if you are one of my special commenters! Oh for the love of God! First it’s a new bed! Then it’s MATCHING coverlet and pillow shams with bed skirt! Now? I gotta start construction on the backyard waterpark! Wow, very scary stuff with the car accident. So glad it wasn’t worse. Hope Keelan and her friend are on the mend soon. Lovely guest room, tv table or not. It’s so cozy and inviting. I’m glad Keelan’s accident wasn’t worse. 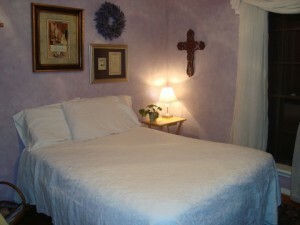 Is that a lavender wreath above the bed? I love lavender wreaths. Summer would be the perfect time for you to open a lavender-themed B&B. I’m sure you’d be quite the entertaining hostess. It IS in fact lavender. And, it’s the very best kind! Fake! However, I don’t want you for one minute to think that I take my hostess duties lightly. I have been known to go in that room with a can of air freshener and blast the hell out of the place. And believe me, Susan, if you come visit me I will be aaaaall over the stank in this house. How’s that for an invitation? Just makes you want to hurry on down here, huh? I love that I now have a place to stay in Half Assticville. Should I ever find myself in that neck of the woods, I’d love to visit. For real. And I’d love to have you! FOR REAL! Make room for my shoes sista! I have ALL KINDS of room for your shoes! Bring it on!